Corning's tough Gorilla Glass is found in many portable devices like the Dell Streak, Samsung Galaxy S and Galaxy Tab, and other various portable devices. 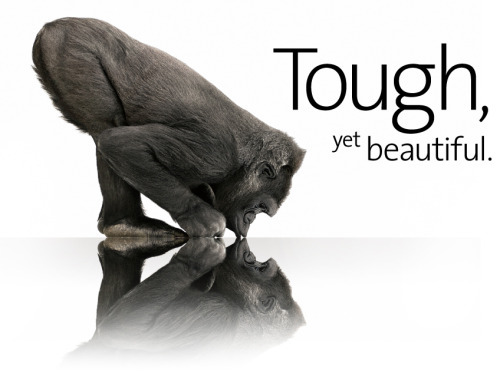 Corning's new ads display the toughness of the Gorilla Glass which is now being used in kitchen appliances and LCD televisions like the Sony Bravia. The Gorilla Glass really is as tough as Corning claims with many tests users have done like stabbing devices using Gorilla Glass as screens with sharp objects. Unlike Apple's tough yet fragile glass screen found on the iPhone which can crack and break from a simple drop, Corning claims their Gorilla Glass is tough, damage-resistant, scratch-resistant and helps protect the coolest smartphones from everyday drops and bumps. If Apple's upcoming iPhone 5 will still be made from glass on both sides, I want some Gorilla Glass. Check out the new videos below.